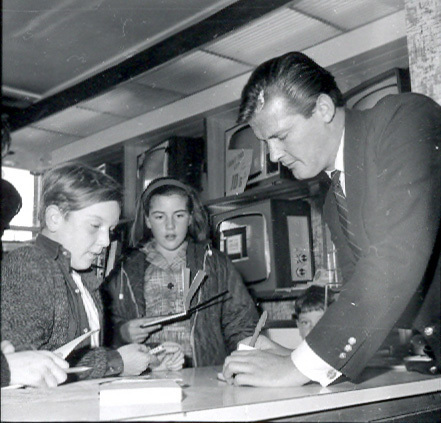 Here we see a young Roger Moore pictured signing autographs for children in a TV store. He didn’t star in his first James Bond film until 1973, but was already famous for his role in the Saint at this time, and less than two after this photo he was considered not just a national but an international top star. Less well known is that he served in the Royal Army Service Corps after WWII, eventually reaching the rank of captain. He later transferred to the entertainment branch (under such luminaries as Spike Milligan, among others). These two children certainly look excited to be meeting him, perhaps adding to a burgeoning collection of autographs. This page was added on 23/03/2010. I could only have been 6 then but I remember him in the White sports car the amount of people that turned out must have been the whole estate. I remember it being near to the station. I remember this so well as me and my friends were so excited about seeing Roger Moore, we would have been about 8. I was also there for the opening….I was about 8 or 9 and I also remember the car and that he was mate of the owner. 65 sounds right. I think he lived up in Moor Park? Just found a note I’d made of this event – it was the opening of Mill Hill TV shop in Oxhey in October 1965. He was a friend of the owner Derek Tyne. I remember that, getting crushed at the bus stop, and I only wanted to see his white car. I must have been about 8 at the time. Blimmey. I agree that this is a grand opening- are you sure about the year. I’m thinking a bit earlier, Ivanho time?